Should a State Legislator be indebted to ACORN? 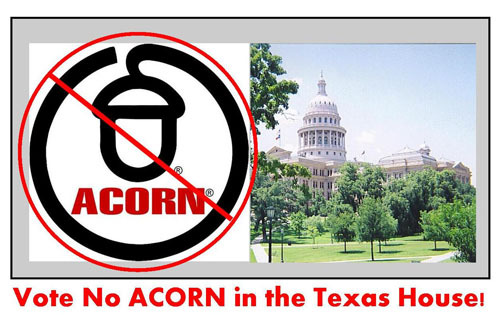 The Republican Party of Texas announced that the Democrat State Representative from District 133, Kristi Thibaut is receiving huge donations to keep her seat from liberal interest groups, labor unions, trial lawyers and yes, even from ACORN! Kristi is in a race with former Texas State Legislator Jim Murphy who is running to reclaim this seat for Conservative Republicans. Murphy was originally elected to the Texas Legislature in 2006 and was knocked out in the "Obamawave" of 2008. It is time for us to put this seat back in Conservative hands and help increase the Conservative margin in the Texas Legislature. With redistricting becoming the major issue for the 2011 legislative session it is increasingly important that we win every seat we can this year!